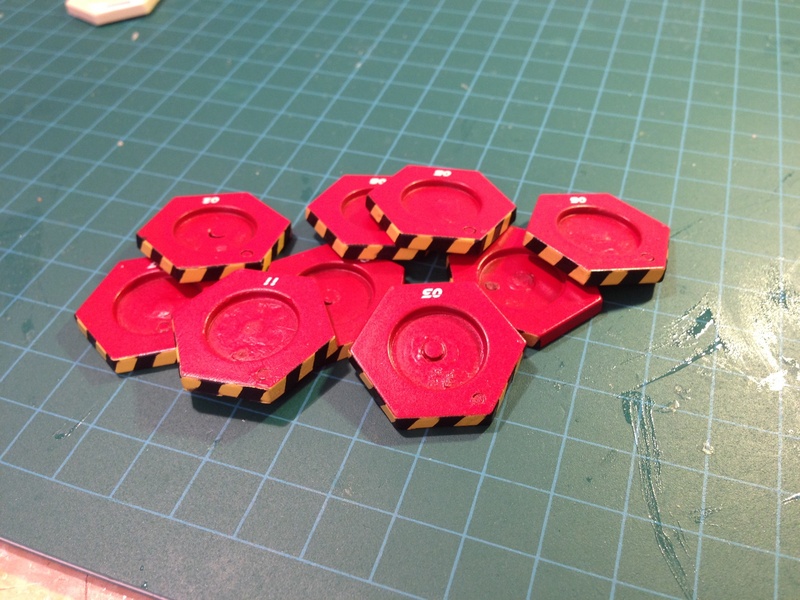 I wanted to use this post to talk about my journey with DreadBall bases. 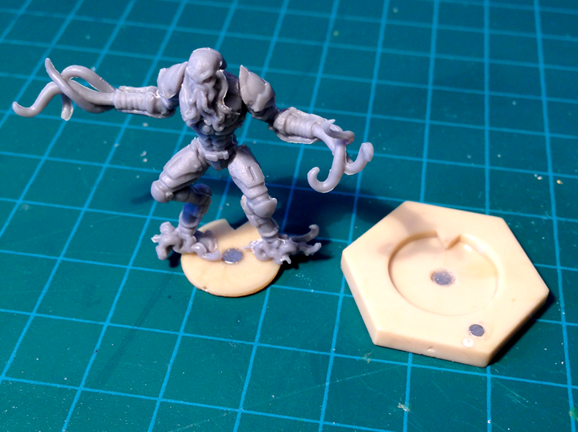 DreadBall miniatures come with a 25mm, clear plastic, hex shaped base. 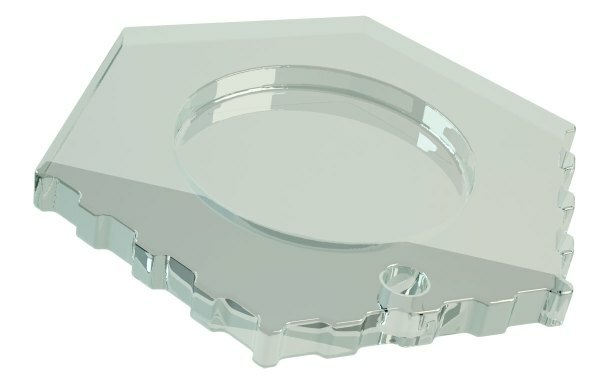 The base has a space for an insert in the middle. 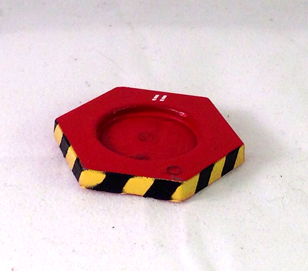 The miniatures themselves have a small round base attached which fits into this insert. When I first received my DreadBall stuff from the first KickStarter I had way more miniatures than bases. I puzzled over what to do. I didn’t want to not be able to play with all my minis because of a shortage of bases. Additionally there was the Robot team. The Robot team players can transform, changing their role on the DreadBall pitch. The different roles are represented by different miniatures. Because you are supposed to also number the players and because a Robot team has 6 players, each with 3 possible roles, you’d need 18 miniatures if you wanted to be able to transform all the robots. A Robot team does not come with 18 miniatures. After giving it a bit of thought the solution I decided upon was to use magnets. 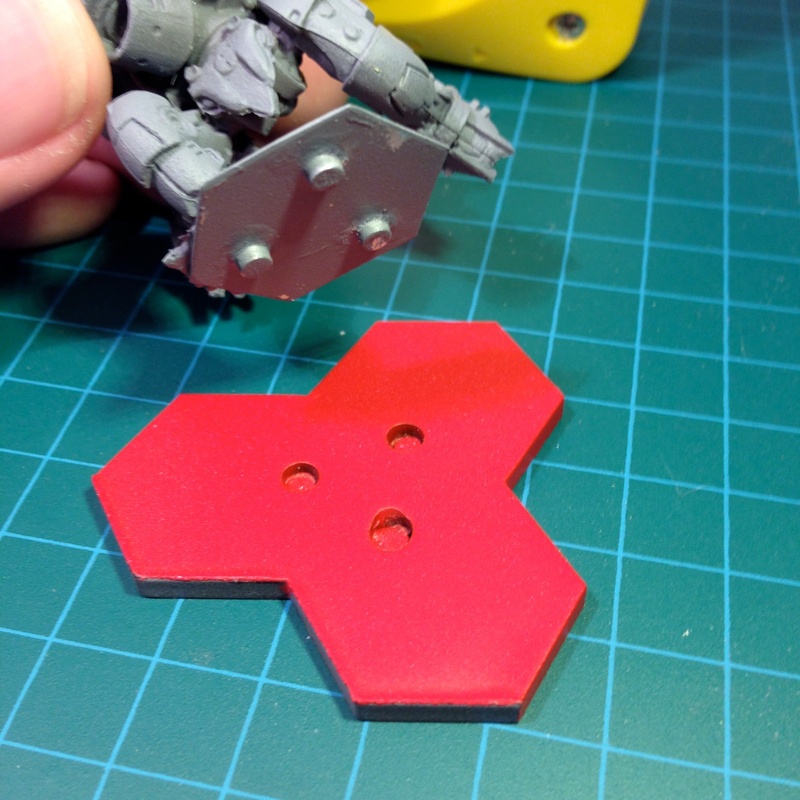 A magnet in the 25mm hex base and another magnet in the miniatures integrated round base would allow me to swap miniatures and entire teams between the bases. I could magnetise and paint a single set of 14 bases (the maximum number of players on a DreadBall team) and use those bases with all my teams. I decided that putting the player’s number on the base instead of on their back would also solve the Robot team problem. When a Robot transforms to another position I just pop the current mini off the base and snap the miniature representing the new position on. The player number is the same because it’s on the base. Since I was going to use magnets to attach the minis to their hex bases I chose to also use magnets to snap the ball onto the base while the player was carrying the ball. I did not like the ball just resting on the base, it tended to fall off while moving the minis around. The first design I came up with, the Mark I, was very simple. I drilled 3 holes. 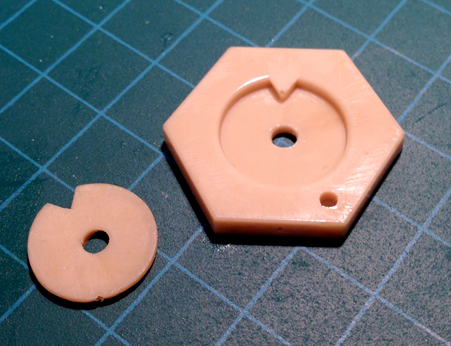 One hole in the center of the hex base, one in the center of the miniatures base insert, and finally a smaller hole, for a smaller magnet to hold the ball (the ball also got a hole and a magnet). My first design worked pretty well but there was an issue. The mini snapped on to the base well, the ball snapped onto the base great, but the mini tended to spin. 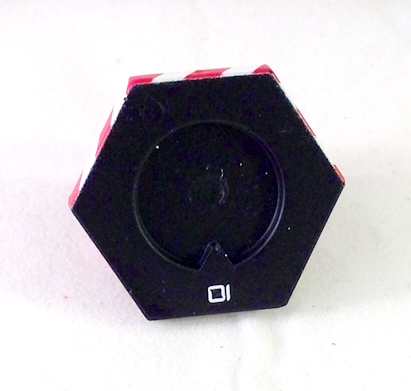 Because the magnet was in the center of the base, the circular insert the mini was attached to would rotate about. My attempt to reduce the mini rotating was to drill another hole and put a second, smaller magnet, off center in the front of the insert space. This design is the Mark II. The Mark II bases were pretty good and I used them for awhile. The miniature still had a tendency to rotate. They rotated less than with the Mark I bases but it still bothered me. Along came the Mark III. The Mark III base design maintained the singe central magnet but got rid of the smaller secondary magnet. 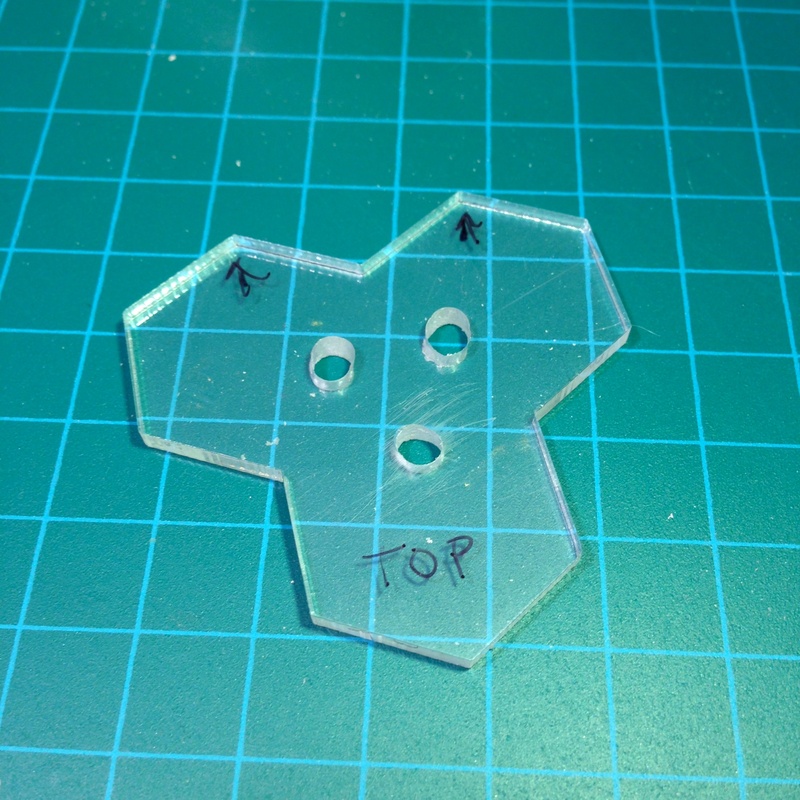 To prevent rotation of the mini a groove was cut into the miniatures base insert and a notch was added to the back of the hex base’s insert space. To create bases with this notch I sculpted the first one using epoxy putty and then made a mold from it. Once I had the mold I made several bases out of resin. 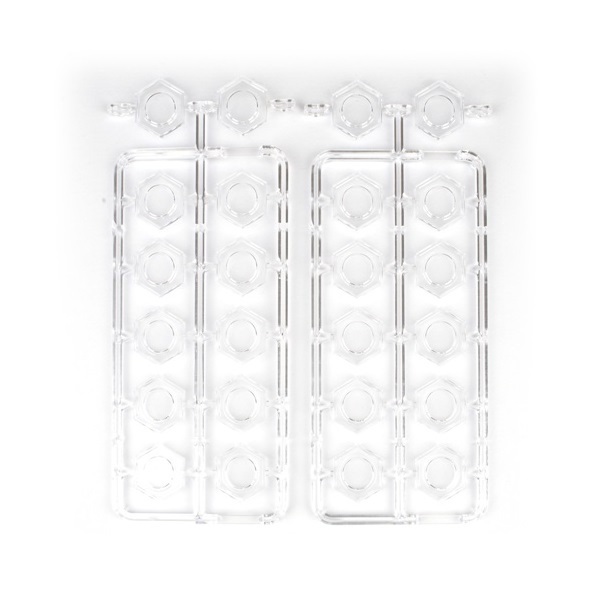 Silicon mold made from bases modified using green stuff. Resin base and insert made using mold. Mini snapped onto a Mark III base. The Mark III bases were really good. There was no way for the minis to rotate. These bases were my primary bases for a long time. My only complaint with the Mark III bases was the magnets weren’t as strong as I wanted. In the heat of play sometime the minis could temporarily come off the bases. Solution: 3D printing. 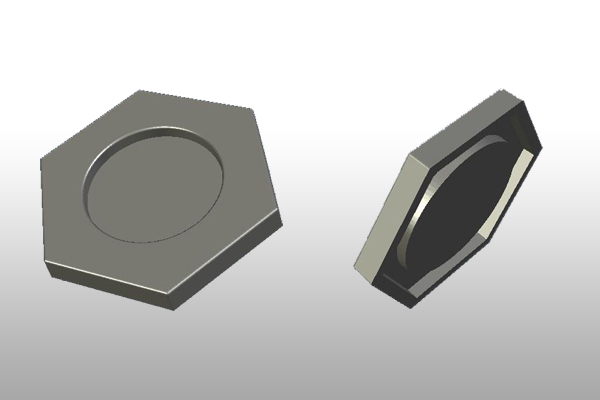 I wanted to come up with a base design in which the mini would not rotate and a larger magnet could be used. The groove and notch design was good for preventing rotation but I felt there was a better way. 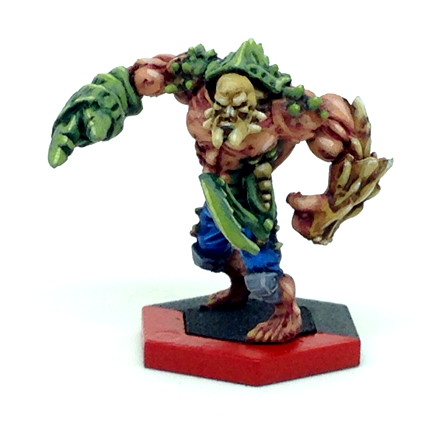 I had played around with a hex shaped base insert earlier but creating it out of green stuff was a pain. 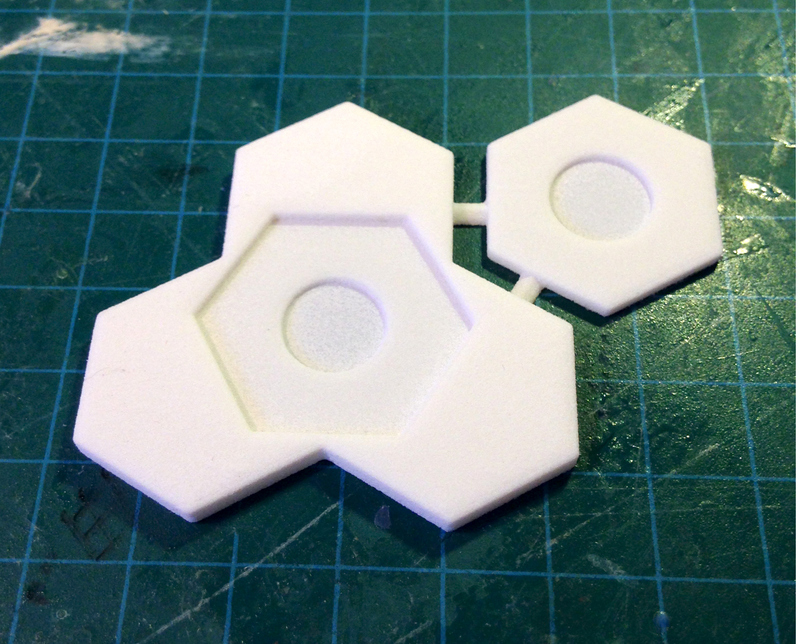 Hex insert prototype on prototype base. 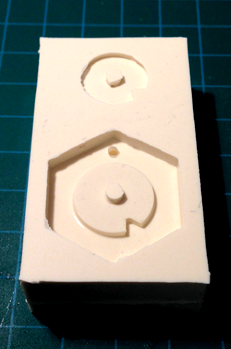 As well as being a pain to create the hex base with a space for a hex insert it still had the same small magnet. I decided to try my hand at 3D printing. 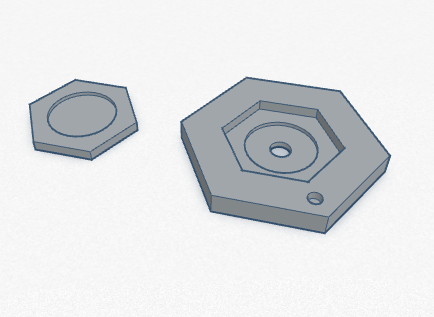 I used TinkerCAD to design a base and insert that would be hex shaped to prevent rotation as well as have a recess for a larger magnet. 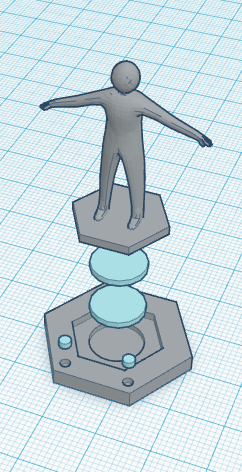 Thus was born the Mark IV base design. Mini on a Mark IV base. I love the Mark 4 bases. 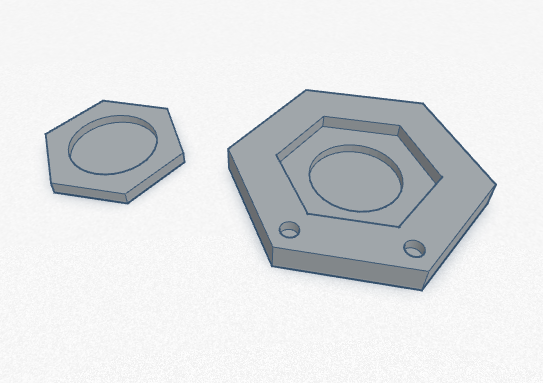 Since their design I have made a few small improvements to them resulting in the Mark V. Mark V bases use thicker magnets so have an even stronger attachment than the Mark IV bases and Mark V bases have 2 magnet holes for ball holding magnets. 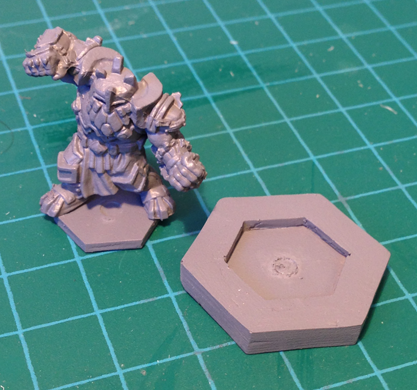 As well as creating and evolving bases for my DreadBall regular players I also worked on tri-hex bases for my DreadBall giants. 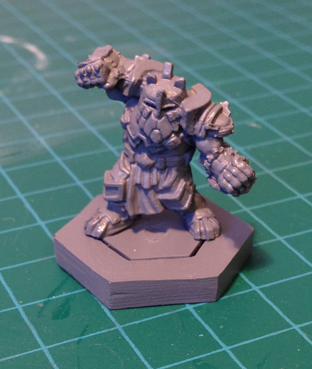 In DreadBall there are special MVP player that are classified as giants these giant are attached to large tri-hex bases the size of 3 25mm hex bases combined. 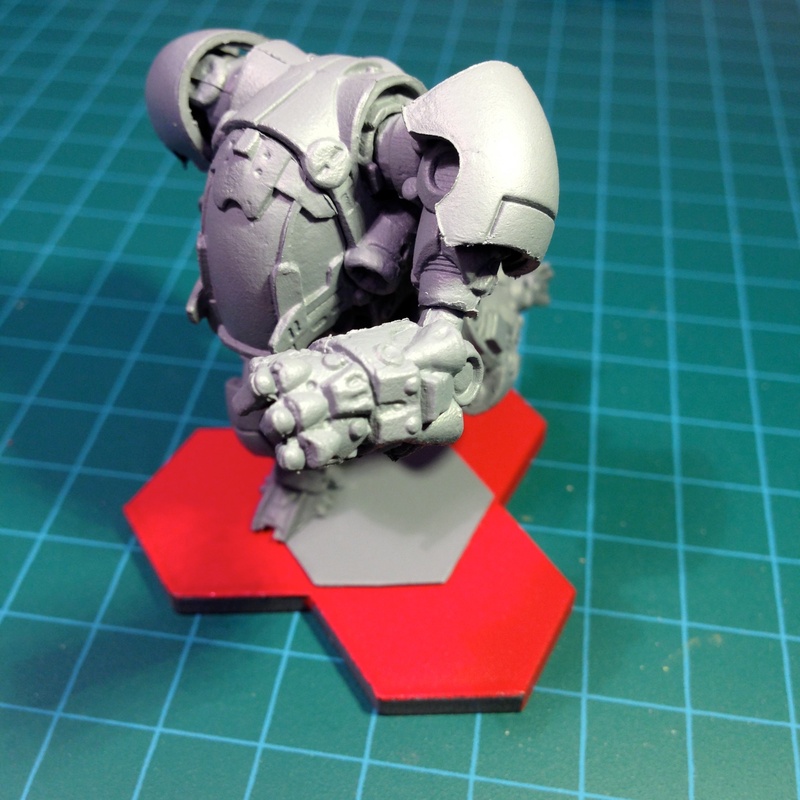 My first attempt at a magnetised giant, tri-hex, base along side the development of the Mark I and Mark II base designs was ok but I never loved it. I attached the giants to a flat plate and glued 3 magnets in a triangle onto the bottom of the plate. 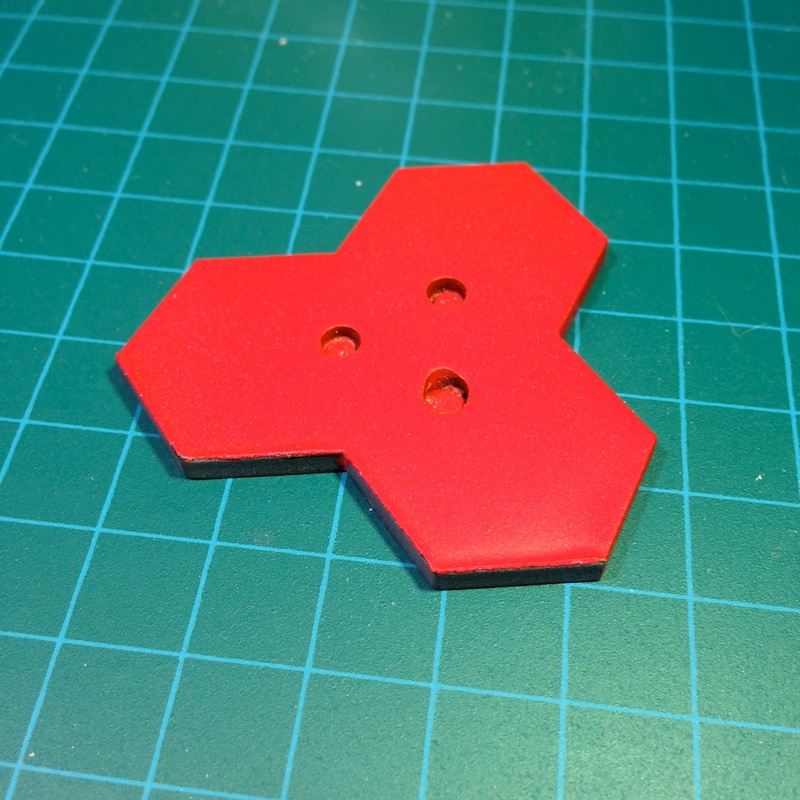 I drilled 3 holes in a standard tri-hex base and glued magnets in the holes. It worked but it wasn’t amazing. Holes drilled in tri-hex base. 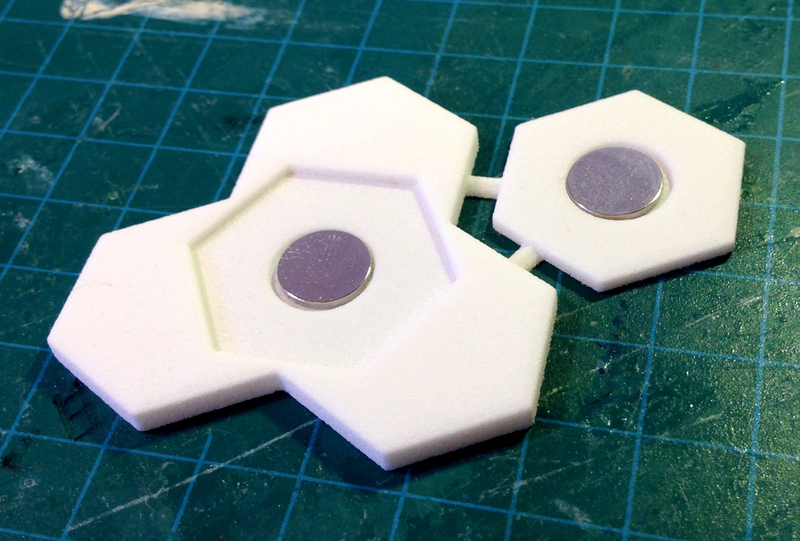 Magnets glued into tri-hex base. 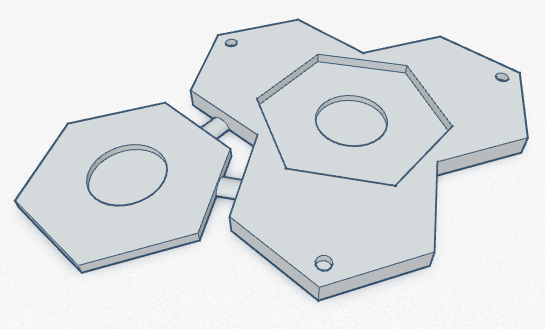 When I set about designing my new bases in 3D, I also redesigned my giant tri-hex bases. The new design was much nicer and is my currently used design. 3D print of an earlier design I forgot to put ball magnet holes in. 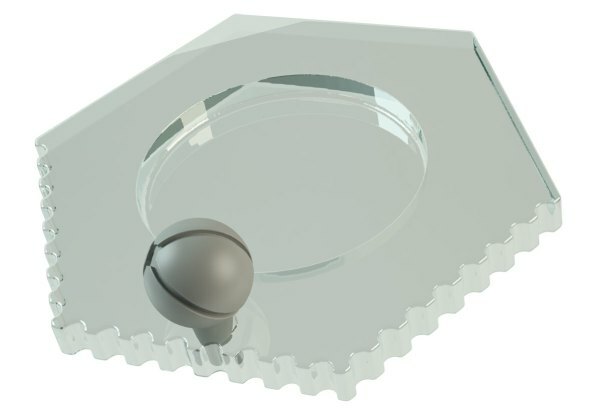 Gaint base design with 3 magnet holes for holding the ball. I have had a lot of hobby fun coming up with my current base designs. I’m currently very happy with them and don’t see any more revisions in the future but you never know. DreadBall 2nd Edition is right around the corner. Evolution of my base insert design. 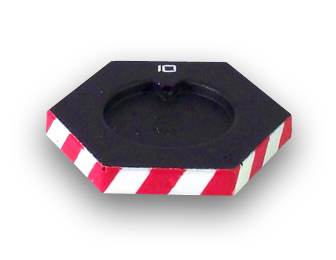 What we’ve seen of the DreadBall 2e bases so far shows they will have a crenellated threat edge to clearly indicate the front (threat hexes) arc of the mini even if the bases are not painted. The DB2 bases also have a hole in them to hold the new balls which are a bit larger and come with a peg to slot into the base. 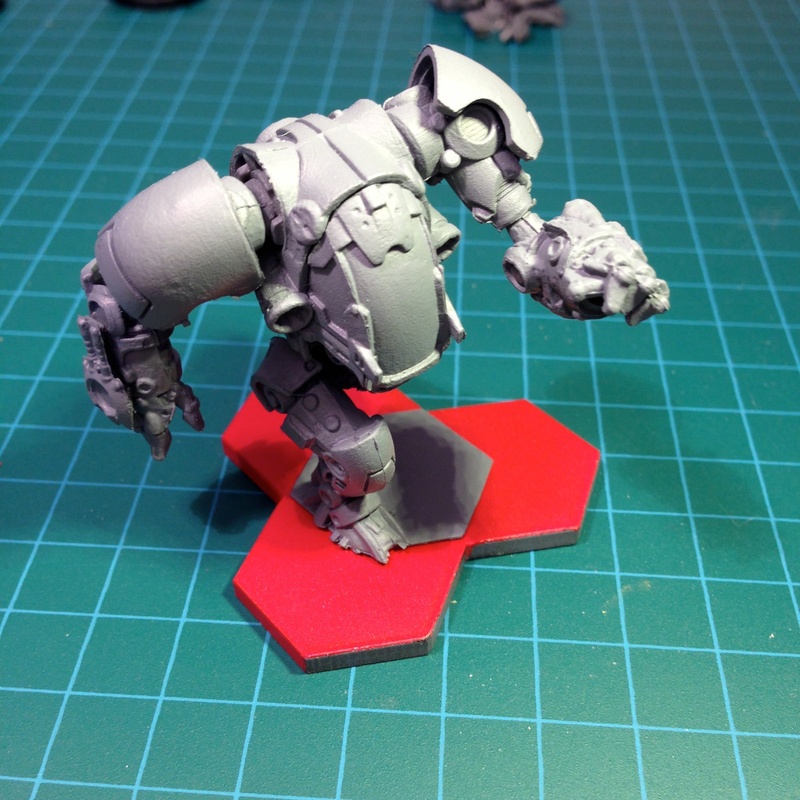 DreadBall 2nd Edition base with crenellated threat hexes. 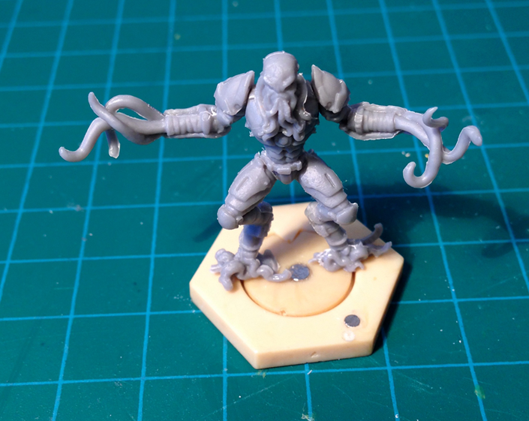 DreadBall 2e base with an alternate crenellation pattern. 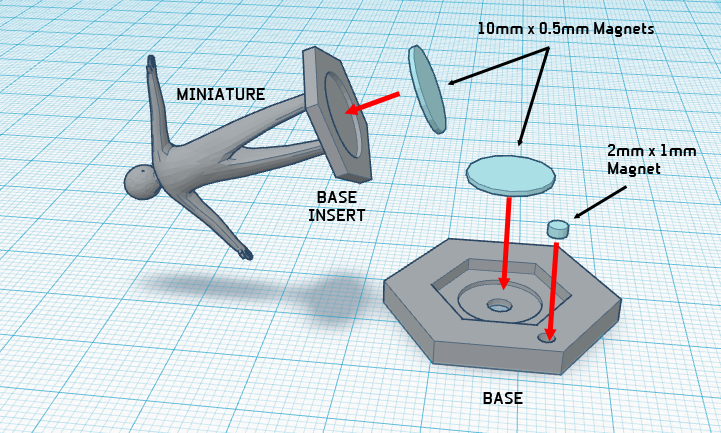 DreadBall 2nd Edition base and ball concept. 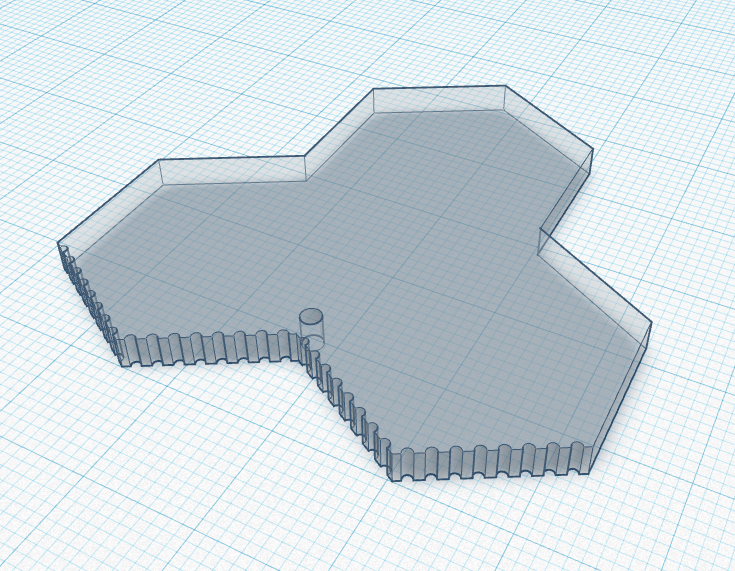 Idea for a tri-hex base with crenellated threat edges. 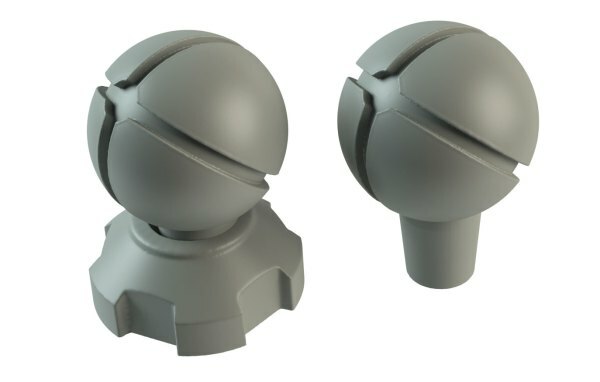 I like the look and design of the new bases and balls for DreadBall 2nd Edition but I will likely not use the bases. I’ve put a lot of time and effort into coming up with bases I’m happy with. I will likely use the new balls but I will cut off the pegs and put magnets in them so they work with my current bases.